Little Bohdana was a puppy born in a kennel while her dam was in protective custody in an abuse and neglect case. 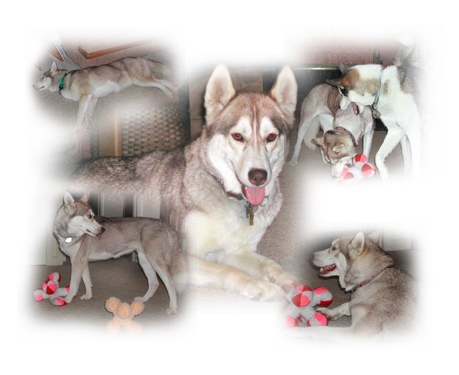 The kennel staff loved the puppies and played with them all the time, but Bohdana had never known the delights of a real home until Tails of the Tundra took her into foster care when she was 13 months old. She was so sweet and gentle that we found a home for her within a few weeks and we (and she) thought she was in her forever-and-a-day home. But the family's circumstances changed so drastically that they had to return her to us for her own good in a little over six months. So suddenly she found herself in her third home, counting the first foster home, in nine months. The poor little girl was so confused and baffled and she was very unsure of the new circumstance...except that there was a male puppy just about her own age and the two of them formed a real bond. Her new foster home had just lost their oldest personal dog, with which Cheryl, her foster mom, had been very strongly bonded, and Polya, the male pup, was missing his old grandmotherly friend immensely. He needed a playmate badly and the other female, Tula, wasn't nearly as much fun as Bohdana, who had really been called Ivana from the very beginning. Ivana was the first foster dog that Cheryl and John had taken that talked her way into the bedroom at night, getting her crate put at the base of the bed because she was so unhappy in the dining room. Something unusual was going on here. 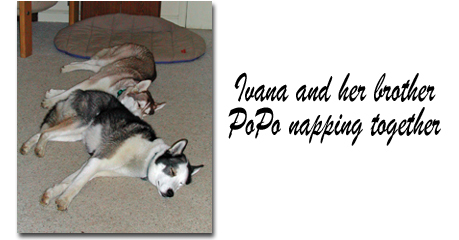 Pretty soon, Polya and Ivana were inseparable, wrestling and playing all their waking hours, falling asleep gently chewing on each other, waking each other up to see if they could play some more. The two had been separated for nearly a month while Cheryl took Polya and Tula on a long trip with her, and Ivana had refused to eat for a while and had been glum most of the time. When they returned, Ivana was overjoyed. Her friends had not abandoned her after all! Cheryl was back and getting jumped all over, Polya was leaping up and down to play with his long-lost buddy, and Tula didn't care one way or the other. And Ivana's appetite returned in full force--immediately! Finally, Cheryl and John said, "How can we separate these two? Each one would die the death of a rag baby without the other. Besides, our home is awfully empty without a third dog. She comes in and tells us all about the back yard every morning, just like Kemo Sabe did. She has returned The Riot Squad to the state in which it got its happy name. We need this girl as much as she needs us. We just cannot send her to a fourth home and take any chance that she will not stay. She's just too sweet." So the Little Red-headed Girl and Polya "Charlie Brown" Puppybrain are together forever and will not have to worry about being separated again. The home is once again happily full of furry bodies and Ivana has come home to stay. Welcome home, Little Red-headed Girl. Maybe I should report on how Ivana is doing since we adopted her last November... the answer is: Great. She's worked her way into The Riot Squad and found her place well below Tula but just ever so slightly above Polya in the hierarchy. (He's such a goofball that I don't think he cares in the least so long as someone will chase and wrestle with him.) 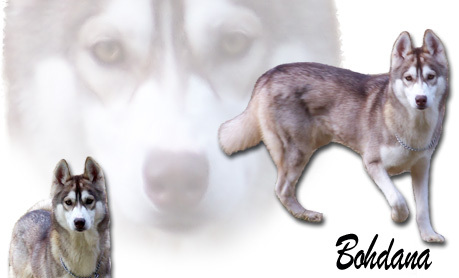 In fact, I'd say she's formed a sort of link between Polya and Tula and the three of them are forming a pack bond that includes Tula, who's actually been seen playing with the other two once in a while. She's been quite healthy and has pretty much regained her confidence around people, although she still up-ends herself for a belly rub at the slightest excuse. She has decided that she has to sit if she wants food or treats, and has stopped backing up into the next room when she does so. She no longer refuses to come in if she's outside or to go outside if she's inside (except for once in a while when she just doesn't feel like it, which is different from the way she was doing this before). She dearly loves kids and pesters my flute students mercilessly while they're waiting for their lesson. (All my dogs are firmly convinced that the kids come to see them first and learn about flute second.) I have one student that loves her back just as dearly and watching the two of them commune while waiting for me to finish with the previous student is just plain sweet. She and Polya engage in regular wrestling matches (like every two hours) in which she pretty much pins him to the floor and spins him around on his back by pushing at his throat while he kicks like a furry little frog. Then Tula the Hall Monitor comes out and chases her off Polya, and then lies down in the middle of the living room floor looking very pleased with herself. When neither of them feels like chasing or wrestling, they can usually be found sleeping close together and rarely does one of them stay on a different side of the back door from the other. We think we finally have the housebreaking problem solved, partially because she now feels that the place is hers (and she is a pretty territorial little girl, even if Tula is the boss dog around here) and partially because we've learned to figure out when she wants to go out, which she signals in a fairly subtle way. We are still, however, crating her at night and when we go out just so that she won't find it expedient to go do something on the floor if she can't wake us up or find us. Also we don't trust two 2 1/2 yo pups not to get themselves into trouble if allowed to roam about the house unsupervised. And she has just finished another rite of passage. This afternoon she caught her first rabbit. Now granted it was a small juvenile one, but it was a rabbit, and one that Tula wanted badly. Ivana has been trying for months to catch a rabbit since she's the only dog in the place that had never done so. The entire gang spent hours this morning trying to get something that was hiding in a roll of fencing that's been sitting in the back of our yard for some years. There were two large rolls of chain-link fencing lying on top of that roll when they started their quest, but it didn't take long before that problem was solved and those two rolls are now lying in the middle of the back of the yard. I suspect the quarry was the rabbit that Ivana later caught. If I could change just one thing? Probably it would be the way she rakes at me for scratching when she's had to go, say, two hours without it. But that is occurring less frequently when she finds out I yell and turn away from her when she does it.